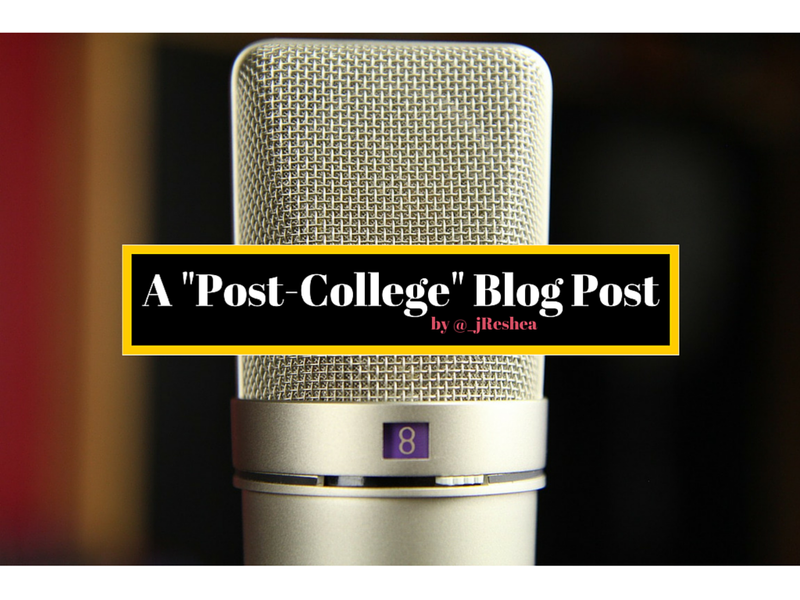 “Post-College” is a series of blog posts featuring everyday young people as they work to achieve the life and career that they dreamed of. Few of them find themselves in places that they mapped out and most of them are okay with that. Amy Nicole is a 29 year old writer. She’s one half of the web personality The Double Scoop. What are the past positions you’ve held that you are most proud of and why. My first job out of grad school was working at a college; I worked as an advisor and adjunct professor. I was very proud of obtaining this position because I was the youngest person in my department(the only person in my 20’s) and it was my first time having my very own office. I quit this job a year ½ ago because it wasn’t my passion. What were some of the most disappointing positions you’ve held or work that you’ve done? After I quit my job to pursue my passion for writing it was really hard trying to obtain another professional job in my field. This past year I’ve pretty much been working at call centers jobs. It was one of the worst jobs that I’ve ever had! Having to deal with irate customers cussing me out all day, not being respected by managers, and working for minimum wage was a very humbling experience. I realized how much I took my professional job for granted and the experience also made me realize just how quickly my job situation could change. What positions or past work have you held/done that you feel got you to the point you’re at today and explain the connection. When I quit my job I had no idea what I was going to do next with my life; I just knew that I wasn’t happy and I wanted to find out what my purpose in life was. I moved to South Carolina to stay with my brother so that I could be in a new surrounding that would give me better guidance for my life. While in SC I ended up getting a film internship where I learned a lot about media and film. While interning that’s when the light bulb went off and I realized writing is what I wanted to do full time! When I was a kid my twin sister and I used to write short stories all the time and I always had a love for film and the arts. I was discouraged from pursuing that type of field while I was in college because my parents told me that it would be hard to land a job in that type of industry. What would you say is the most invaluable information or advice you could pass on to those who are looking to get into your field? If you’re currently unemployed or not in your desired field , how would you help others avoid the situation you’re in? Stay consistent, utilize all social media outlets, and network! network! network! I’m not at the point where I can do my writing full time and make a living off of it but I’ve definitely developed a pretty decent following just by being consistent. It hasn’t even been a year yet since my sister and I launched our blog but we have made so many connections simply by being consistent. We’ve had directors, book authors and musicians reach out to us regarding collaborating. I definitely wish I would have done all of this in my early 20’s so the advice I would give to people right out of college is to take the time to find out what you really want to do before starting a career or going to grad school. Do some traveling, apply for an internship in something you’re interested in, or do some volunteer work abroad. Really take the time to find out who you are as a person and what you want to accomplish out of life. What did your life after school look like? Lol I finished undergrad with a degree in Psychology! Anyone who graduated with this degree knows that you pretty much can’t do anything with it unless you get a higher degree. I ended up working at a bank for a year before starting grad school. I was still indecisive about what I wanted to do career wise but I knew I had a passion for helping people. I decided to go to grad school for counseling which I later changed to higher education administration. How do you think college prepared you for what you’re experiencing today? I’ve had this conversation with many millennials my age and a lot of us feel like college didn’t prepare us too much for our experiences today. Many people who go to college end up working jobs that are not in their fields. A lot of us have thousands of dollars of student loan debt which most of us can barley afford to pay back with the jobs that we obtain after graduating. My sister and I both have two degrees and it has been extremely hard for us to find decent salary jobs. College pretty much teaches you how to work for somebody else when in actuality we should all be working for ourselves and building our own empire. My sister and I plan on building our own empire with our blog. How much of what you’re doing today did you learn in other ways besides formal education? I learned a lot about writing just by reading books, watching movies, and observing people. I’ve always been more on the quite side so I’ve always expressed myself better through writing than verbally. What are other resources that you ended up relying on heavily to fill in the gaps of what you didn’t learn in school? What would you do differently if you could and why? I wish I would have taken the time out to find out who I was as a person and what I really wanted out of life before going to college or grad school. I always felt this pressure by my parents to go to school and I never really established what exactly I wanted to do. I think people should take 1-2 years off after finishing high school before going to college just to find out what they really want to do career wise. How have you pulled yourself out of a job funk or hole before? Talk about that experience. Honestly this might not be the best advice but I quit my job LOL! After working at a call center for a year I couldn’t take it anymore. The job was taking a serious toll on my mental and physical health so I quit and moved back home. (Luckily I had family to help me get back on my feet)! That year taught me to appreciate having a professional job and it also humbled me. I will never forget that year because it made me realize how drastically my job situation could change and how I could end up working a minimum wage job. When you’re working for someone else you will never truly have job security which is why I’m building my business now. What are your goals and what are some ways you plan on achieving them? My goal is to be able to write full time as a career. I want to do some script writing, produce short films and documentaries, write a book, and to continue to write for my blog. I will achieve these goals by continuing to stay consistent with my writing and to continue networking with people in the media industry. What are some of the ways that you keep yourself motivated to stay on track and stick to your goals? Limiting social media has been very helpful for me. I recently deactivated my Facebook page and I also deleted my personal Instagram. Too much social media exposure was causing me to be depressed because I would start to compare myself to other people my age and I felt like I was behind in where I should be in my life. Comparing yourself to someone is one of the most detrimental things that you can do to yourself. God has a different timeline for all of us, you just need to trust that you are right where you are supposed to be in life. Also surround yourself with uplifting people who support your dreams and aspirations. Never give up! Don’t let anyone make you give up on your dreams! If you’re passionate about your craft, work hard, and are consistent you will be successful! That wraps up Amy’s interview. Check back in every Thursday for a new post in the series. If you’re interested in sharing your own experiences, here’s how. This entry was tagged Amy Nicole, career advice, career stories, features, Post-College, the Double Scoop, writing. Bookmark the permalink.